Paula Elizabeth Bressman, a native of Nashville, enjoys an active and varied performance career in both classical and popular genres. She plays regularly as substitute principal harpists and second harpist in the Nashville Symphony Orchestra, is principal harpist of Gateway Chamber Orchestra and Orchestra Kentucky Bowling Green, and was a finalist in Miami’s New World Symphony (2011-2012). As an orchestral musician, she has played with artists including Three Dog Night, Sheryl Crow, Miranda Lambert, Neil Sedaka, Mark O’Connor, Frankie Valli, Evanescence, and Jennifer Nettles. Paula also plays with Music City Hitmakers (Nashville’s chart-topping songwriters) with whom she backed Dan + Shay during the 2016 ASCAP Country Awards at the Ryman Auditorium and 2016 CMA Music Festival. 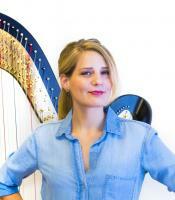 Ms. Bressman arranges and performs pop, rock, and classical music as half of the harp duo Beyond Pluck with Rachel Miller. The two present multimedia and multidisciplinary programs with astronomers, filmmakers, dancers, and drummers, and have performed across the United States and Puerto Rico. They have also collaborated with neuroscientists and performed at the 2012 Neurosurgical Society of America Meeting as part of a “Music and the Brain” project with Northwestern University’s Feinberg School of Medicine and KV 265. Beyond Pluck has been featured in Nashville Arts Magazine, Houston Public Media’s Classical Classroom, and Harp Column. Their recording of Ms. Bressman’s arrangement of The Who’s Baba O’Riley is used in advertisements across the United Kingdom for telecommunications company TalkTalk. A passionate music educator, Ms. Bressman joined the faculty of Vanderbilt University’s Blair School of Music as Adjunct Artist Teacher of Harp in 2016. She is also on faculty at Belmont University School of Music where she has initiated and developed the commercial harp major. She earned her Bachelor of Music in Harp Performance at Vanderbilt University's Blair School of Music under the tutelage of Marian Shaffer and her Master of Music with Gillian Benet Sella at the University of Cincinnati's College-Conservatory of Music.